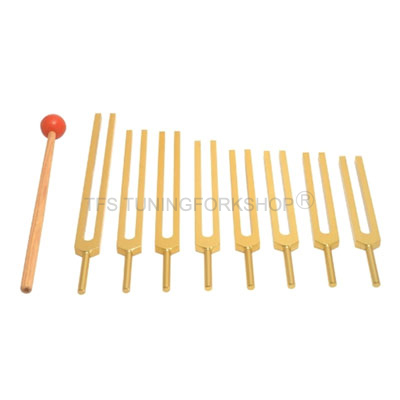 The Harmonic Spectrum Set is a full middle octave of 8 tuning forks (C,D,E,F,G,A,B,C) based on the Pythagorean Scale, also known as the Just Scale. The Harmonic Spectrum Set emanates pure sounds and overtones to help you relax and center yourself. These tuning forks are tuned such that they are more in touch with the physical plane of existence of our body. The physical plane is more concentrated,crystallized in definite form, cognitive and revolves around around the 5 human senses and various parts of our physical body like the tissues, fluids, bones, organs, etc. This set produces pure sounds and overtones, the effect of which is to help relax and centre oneself. Harmonic re-patterning is done to produce different musical intervals. Every such musical interval produces a one of its kind relationship between the subtle energy bodies and the charkas. This is done by working two forks together. It gives instant relaxation and altered state of conciousness.